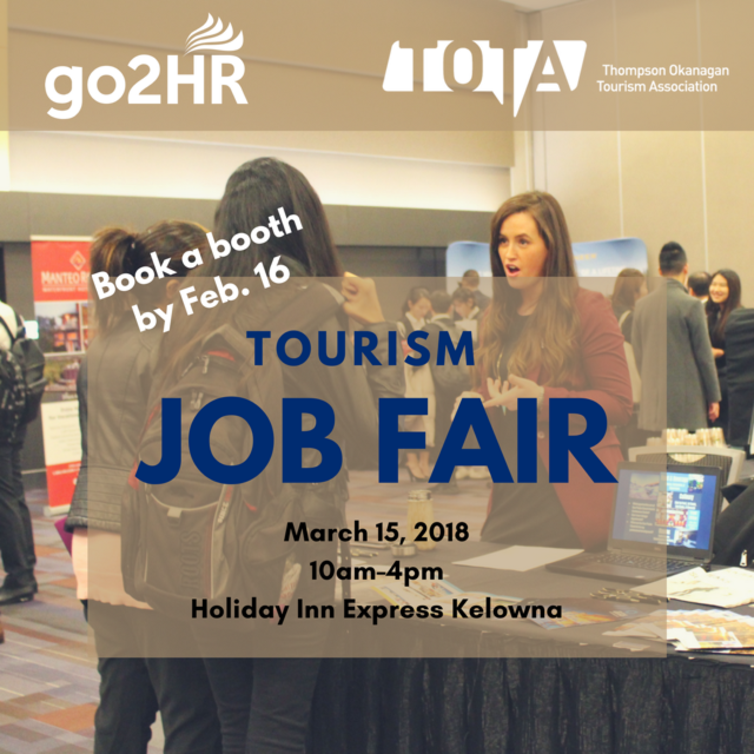 Showcase your business and attract job seekers at the Thompson Okanagan Regional Tourism Job Fair, the largest tourism and hospitality career fair in the region, hosted by go2HR and the Thompson Okanagan Tourism Association (TOTA). Book a booth by February 16 to take advantage of the early bird rate of $275. Booth spaces are limited and will be allotted on a first-come, first-served basis. Click here to register. This interactive, all-day event will be open and actively promoted to the general public, including high school and post-secondary students, through direct marketing, radio, and online channels, including social media. The job fair will feature live demonstrations by local industry professionals to inspire and educate job seekers and students. This is a great opportunity to meet, interview, and hire skilled and enthusiastic candidates on the spot, ensuring you fill all your positions before the busy tourism season kicks in. go2HR and TOTA have also secured a discounted rate at the Holiday Inn Express for employers travelling to the job fair from out of town. For more information, click here. If you have any questions, please contact Ginger Brunner, Regional HR Specialist, go2HR, at (250) 860-5999 ext. 201 or at gbrunner@go2hr.ca.